Yes! 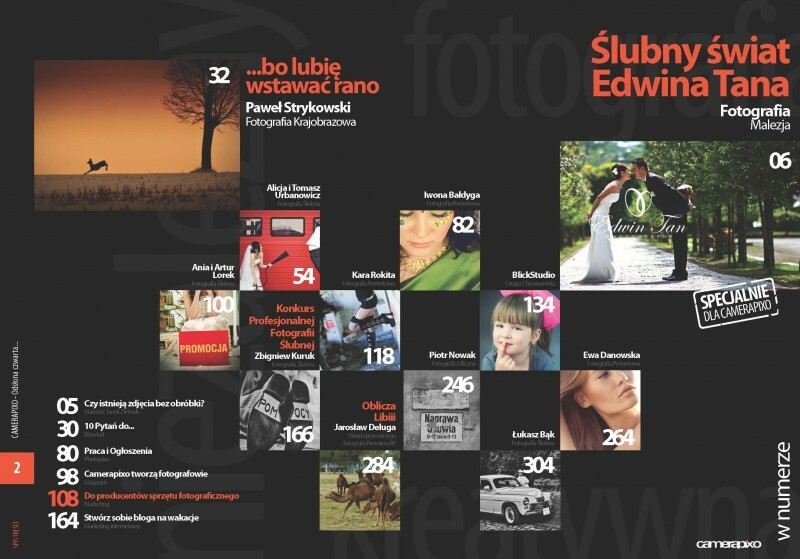 thanks to Mr. Artur Heller, publisher for Camerapixo, Poland who featuring total 15 pages of my wedding photography works in his latest August issue with a front page cover too!! take a look at their fan page in facebook. It is my honour to be the highlights and front cover of Camerapixo, Poland August Issue ! Taking this opportunity, wish to thanks to all the couples that I have work before, thanks for your trust and glad that I am part of your big day in your life by capturing the moments of it. Publisher's special mentionining my name in his column , translated by google : "We also have another surprise. Is it a famous photographer in MalaysiaEdwin Tan. The world-famous artist travels the world tosearching for the best shots. Some of them are presented in thisissue Camerapixo"
Alan Leong - Congratulation! good job! Pamelyn Tan-Corsi - You deserve to be published and recognized. Congratulations on your creative work. Low Bi Hong - Congratulation. Being featured in a Magazine is a big deal!! !